How to sketch skies and clouds. Learning how to sketch skies and clouds is an essential skill to have if you want to sketch outdoors. You can simply not ignore the sky and clouds when you sketch outdoors! Fortunately sketching skies is not a difficult task... if you adopt the following tips, that is! The sky creates the mood of the landscape. It determines the quality of light that permeates the entire subject. Normally lighter at the horizon, the sky gradually becomes deeper overhead. However, it is not until cloud formations appear that a feeling of movement is imparted to a painting, and the painting of clouds is a major problem for many students. They load the canvas with white paint, hoping to capture the fleeting effect before them, and the clouds soon take on a chalky, overworked look with no semblance of atmospheric quality. That is not how to sketch skies and clouds! Clouds are not as white as they first appear to be. They must be carefully observed and the lost-and-found quality of their edges determined, then they can be composed into the sky area to strengthen the entire design of the painting. It would be wise to make, first, several pencil drawings of the various formations so that some knowledge is acquired of their anatomy. At the same time study their values. Notice that the smaller, wispy clouds are darker in value as compared to the larger, heavier clouds. Follow this period of drawing by painting cloud studies, again observing that the smaller clouds are cooler in color when contrasted to the warmer tone of the larger clouds. Some painters apply a toning of yellow ochre and white over the entire sky area. They then paint the sky, leaving the toning the shape of the cloud formations. The clouds are then lightened and modeled to the degree desired. This method helps avoid the chalkiness that is so often found in students' work. As you continue to work and observe you will discover that, while the clouds are constantly changing, a certain pattern does exist. The formation will never be exactlythe same, but the pattern will help you to establish a convincing rendering of the clouds. There is no definite rule as to when the sky should be painted in the development of the subject, but since the sky is the key to the landscape, it should constantly be compared to the rest of the subject to determine the degree of contrast in color values. A water-colorist may prefer to do the sky first, because it is easier to paint any intricate dark shapes over the sky area than to paint the sky around the shapes. On the other hand, a painter using oil may just indicate a few strokes of the sky value overhead, a few more at the horizon, and then concentrate on covering the landscape area. You can work on the sky again later and design cloud forms to fit the over-all composition. Whatever approach you use, always keep checking the relationship of the sky to the landscape. When clouds are painted high in the sky the objects below appear shorter. When painted lower, toward the horizon, the clouds impart a feeling of majestic height tothe objects. The rawness of the blue that is found in so many students' skies can be modified with Raw Umber or Light Red. A touch of either color added to the blue mixture will neutralize the color. 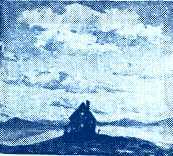 A more "atmospheric" quality can be given to blue skies in a water color by first laying a light Umber wash over the sky area. Allow it to dry before applying the blue. When the landscape is flat and uninteresting, have the sky dominate the composition. Stress the cloud formation, making it as exciting and interesting as possible. Clouds offer a ready means to express recession in your painting. They are the most flexible element in the composition. Use cloud forms as an aid in designing the picture. Below I include one of several methods of painting clouds and sky. 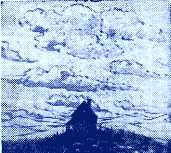 The clouds are quickly sketched in when an interesting formation takes place, the modeling of their forms follows, and the color of the sky is painted last. Be Careful With The Foreground! Learning how to sketch skies is important, but there is also something else to take into account when sketching outdoors: The foreground. Take care not to make the general tone of the foreground too dark, especially if it is in shadow. It should always be luminous enough so that dark objects can be discerned and sharp accents defined. Broken color and paint applied in an impasto manner will impart a textural quality. Because aerial perspective controls the degree of local color, objects closer to you will be stronger in color. The view-finder described on page 80 will be a great help in determining the amount of foreground to include in the painting. If your foreground has a tendency to become fuzzy or overworked, some touches of paint applied with the palette knife will give it an immediate feeling of crisp vitality. Avoid placing a figure in full light in the immediate foreground unless you want the landscape reduced to secondary interest. Be careful not to distort objects. A bush that is close to you will resemble a tree if allowance is not made for the distorted perspective. By establishing the base line of your subject a bit higher, an objectionable immediate foreground can often be eliminated. It is necessary to render a certain amount of detail to bring the foreground toward you, but do not overdo it. Too much detail will prevent the viewer's eye from traveling over the entire composition. Done with how to paint skies and clouds? Go back to the main sketching outdoors section.